FAA form 8610-2 is a U.S. Department of Transportation - Federal Aviation Administration form also known as the "Airman Certificate And/or Rating Application". The latest edition of the form was released in February 1, 1985 and is available for digital filing. Download a fillable PDF version of the FAA Form 8610-2 down below or find it on U.S. Department of Transportation - Federal Aviation Administration Forms website. 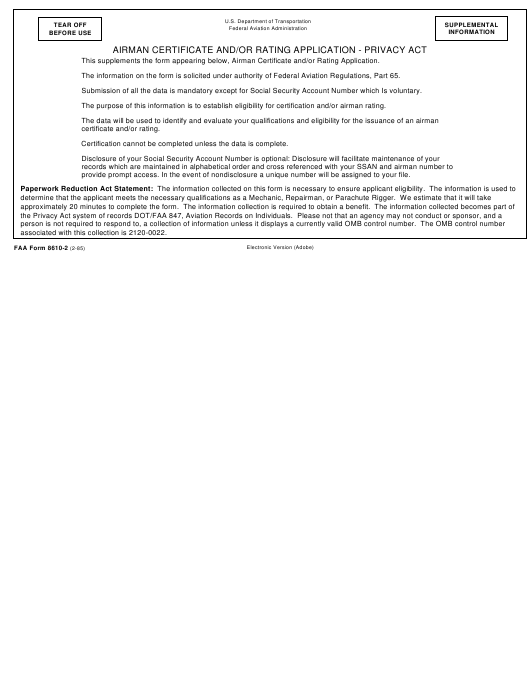 This supplements the form appearing below, Airman Certificate and/or Rating Application. The information on the form is solicited under authority of Federal Aviation Regulations, Part 65. Submission of all the data is mandatory except for Social Security Account Number which Is voluntary. The purpose of this information is to establish eligibility for certification and/or airman rating. Certification cannot be completed unless the data is complete. provide prompt access. In the event of nondisclosure a unique number will be assigned to your file. associated with this collection is 2120-0022. NUMBER AND STREET, P.O. BOX, ETC. L. HAVE YOU EVER HAD AN AIRMAN CERTIFICATE SUSPENDED OR REVOKED? YES (If "Yes," explain on an attached sheet keying to appropriate item number). DRUGS OR SUBSTANCES? . . . . . . . . . . . . . . . . . . . . . . . . . . . . . . . . . . . . . . . . . . . . . . . . . . . . . . .
B. APPLICANT'S OTHER THAN FAA CERTIFICATED SCHOOL GRADUATES. LIST EXPERIENCE RELATING TO CERTIFICATE AND RATING APPLIED FOR. (Continue on separate sheet, if more space is needed). ELIGIBLE TO TAKE THE REQUIRED TESTS. Yes If "Yes," explain on an attached sheet. A. HAVE YOU EVER HAD AN AIRMAN CERTIFICATE SUSPENDED OR REVOKED? . . . . . . . . . . . . . . . DRUGS OR SUBSTANCES? . . . . . . . . . . . . . . . . . . . . . . . . . . . . . . . . . . . . . . . . . . . . . . . . . . . . . . . . . . I CERTIFY THAT THE STATEMENTS BY ME ARE TRUE.